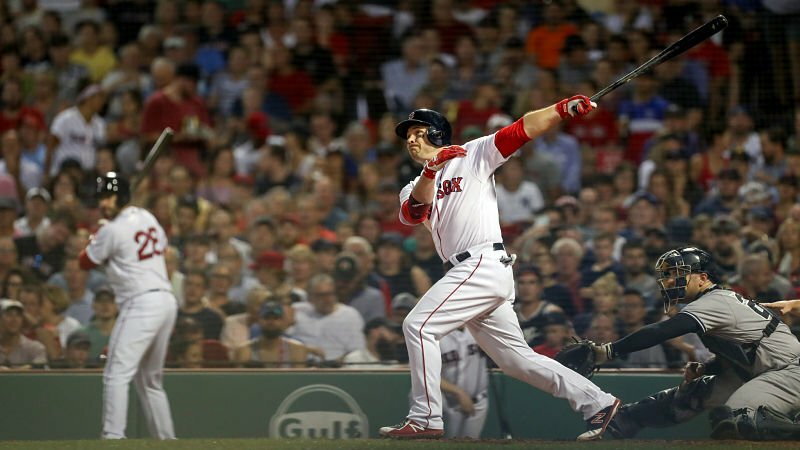 Steve Pearce hit three home runs and drove in six runs as the Red Sox pasted the Yankees 15-7 in the opener of their four-game series Thursday night at Fenway Park. Pearce became just the third Boston player to go deep three times in a game against the Yankees, joining Kevin Millar (2004) and Mo Vaughn (1997). New York took a 3-0 lead in the top of the first inning on Didi Gregorius's 19th home run of the year off starter Brian Johnson before the Red Sox had even recorded an out. Aaron Hicks made it 4-0 with a solo shot in the second. Mookie Betts drove in the first Boston run in the second on a bases-loaded walk and Pearce cut the lead to 4-2 with his first home run of the game in the third. The Red Sox blew the game open in the bottom of the fourth inning scoring eight times punctuated by Pearce's second blast of the game, a three-run shot over everything in left field. Johnson was the winning pitcher, going five innings before turning things over to the bullpen. He allowed five runs (four earned) on six hits and two walks while striking out eleven. One of his bigger moments was striking out Giancarlo Stanton looking in the top of the fourth inning with two on and two out. Mookie Betts led Boston's 19-hit attack with four hits; he reached base a total of six times. Andrew Benintendi, Pearce, J.D. Martinez, and Ian Kinsler each had three hits. The win evened the season series at 5-5 and pushed Boston's lead to 6.5 games in the American League East (five in the loss column).